Powder actuated nail guns are ideal for nailing wood to concrete. They are particularly useful in basement remodeling projects where you need to fasten basement wall sill plates to the concrete floor and/or attach furring strips to concrete basement walls. Powder actuated nail guns use a shot load to drive the nail and are excellent for securing wood to concrete and cement surfaces. The shot load is typically a .22 or .27 caliber explosive. Powder nail guns are powered by gunpowder (cordite) in a controlled explosion. They operate very similarly to a typical firearm, and thus great care needs to be administered when using one. Powder actuated nails, or fasteners, are made out of high quality hardened steel. They come in a variety of options, depending upon the application they are intended for. There are a variety of powder actuated nail guns or tools on the market today. Some are magazine fed or single shot powder actuated. Others are classified as either direct acting or indirect acting. With direct acting, the explosive charge acts directly on the nail head, whereas with the indirect type an intermediate piston is used. There are also automatic or manual piston cycling powder actuated versions and automatic or manual feed charge versions, such as the Remington Stud Driver. Powder actuated nail guns can be purchased at most home improvement stores at very reasonable prices. You can also rent them. When using powder actuated nail guns, it is a good idea to first apply a bead of liquid nails or a similar product to the back of the wood material before fastening it to the concrete wall or floor with the nail gun. When using a powder actuated nail gun, or fastener, extreme caution should be used. Though the powder actuated nail guns have built in safety features, such as built in muzzle interlocks, they still can be very dangerous if used improperly. Note that powder actuated nail guns have a nailing force much more powerful than the ubiquitous pneumatic nail gun. Before using a powder nail gun you should read all of the safety and operating instructions. In addition, most manufacturers offer training and certification programs. It is highly recommended that you attend one of these prior to using a powder actuated nail gun. When working with a powder actuated nail gun always where eye, ear and hand protection. It is also highly recommended that powder actuated nail guns be stored in a locked up area when not in use. For more help on Basement Additions, see HomeAdditionPlus.com’s Basement Remodeling Bid sheet. 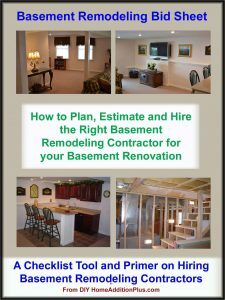 The Basement Remodeling Bid Sheet will help ensure that your hire the right contractor so that your basement remodeling project is done correctly and you get the project finished on time and budget.